Canadian Daily Deals: Ulta Beauty Now Shipping to Canada! Ulta Beauty Now Shipping to Canada! Did you hear the news? Ulta has recently started shipping to Canada! Ulta is a beauty store favourite in the US, they are similar to Shoppers Drug Mart in that they sell luxury and drugstore brands and have a nice points system without the pharmacy and groceries part. We currently don't have any Ulta stores in Canada and it's a store that I always hit up when I am in the US because of their awesome brand variety and brands that we can't get in Canadian stores such as Laura Gellar, Makeup Revolution, Lorac and others! For their Canadian shoppers, Prices are converted to Canadian dollars and will appear as CAD. They claim to make it easy for you by calculating duties and taxes at checkout up fronnt, low international shipping rates, guaranteed landed costs (no additional charges at delivery) and Canada-restricted items will be automatically removed from your bag. But don't get too excited, they use Borderfree to ship (which if you remember Sephora used to use and it was expensive) so your shipping will be hefty unless you plan on spending a lot. And there is always the worry that you will be charged customs/duty when you receive your package (I have only been charged like 1x and I order from US etailers all the time). For example, the Too Faced peach eyeshadow palette is $59 from Sephora Canada, but on the Ulta site it is $69.95 CAD. When browsing the Ulta website and shipping items to Canada, everything seems to be $5-$10 more than Sephora prices. The Free Shipping threshold seems to be $100 CAD and duties/taxes are about 15% of the purchase. You have the options to pay fees/duty up front or once you receive your package at checkout, I did a test order of over $100 and shipping was free, but if I chose the up front option I had an additional $30 tacked onto my order. Be cautious when shopping for sure, it's nice to get access to Ulta, but not really worth it if you are paying an arm and leg for it, best to just make a trip down to the states or get a US friend to order for you. 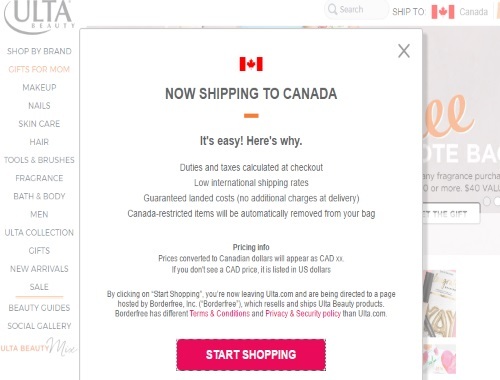 Have you shopped at Ulta online before as a Canadian? Please let us know your experience! Click here to browse Ulta.